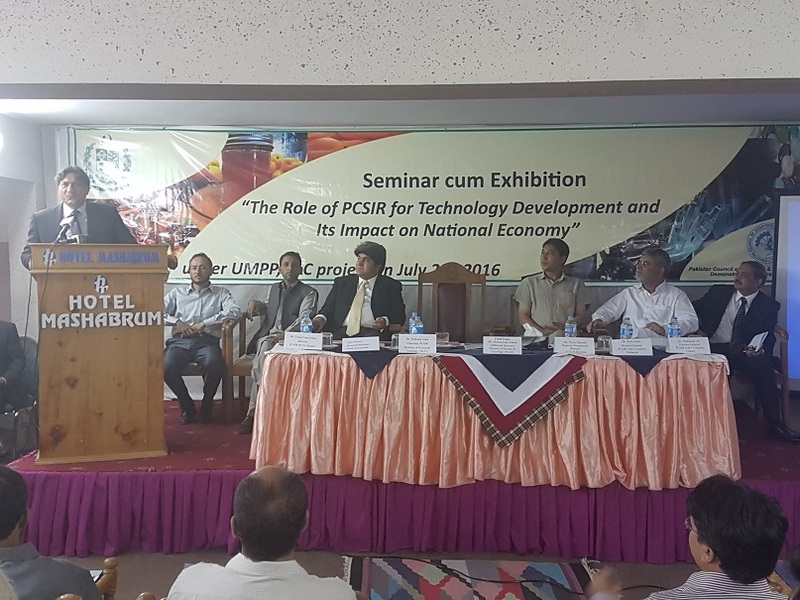 PCSIR organized a one day Seminar on "Role of PCSIR for Industrial Development & its impact on National Economy" at Skardu in a local hotel on 25-07-2016. Pakistan Council of Scientific & Industrial Research (PCSIR), Ministry of Science & Technology Islamabad organized a one day Seminar on "Role of PCSIR for Industrial Development & its impact on National Economy" at Skardu in a local hotel on 25-07-2016. Mr. Muhammad Ashraf, Additional Secretary, Ministry of Science & Technology was Chief Guest of the Inaugural Ceremony of the Seminar, Whereas Dr. Shahzad Alam, Chairman PCSIR along with his senior management was also present at this occasion. The basic aim of the Seminar was to enhance awareness among the local community regarding importance of knowledge based technology development, inventions & innovations achieved by utilizing indigenous resources for economic growth of the country. In the seminar, three potential areas were focused i. e Food Preservation Processing & Mineral Plants/Herbal Resources in Gilgit Baltisfan & Exploitation of Precious Stones Minerals & its value addition for which the lectures were delivered by the relevant echnical experts. The Chief Guest of the ceremony emphasized that to come at the level of developed countries, we have to focus on every field of Science & Technology. Likewise by adopting modern post harvest technology we can reduce major income losses in terms of agri-product lost. Dr. Shahzad Alam in his keynote address disseminated that Research & Development plays a critical role in the innovation process. It has ability to foresight the future problems and their remedies. it, s essentially an investment in technology & future capabilities which is transformed in to new products, processes & services. At the end, the Chief Guest congratulated the management of PCSIR, especially to Dr. Shahzad Alam Chairman PCSIR for organizing this seminar & appreciate the efforts of PCSIR, Scientists / Technologists for contributing in national economy. The shields were also distributed among the resource persons of the seminar.